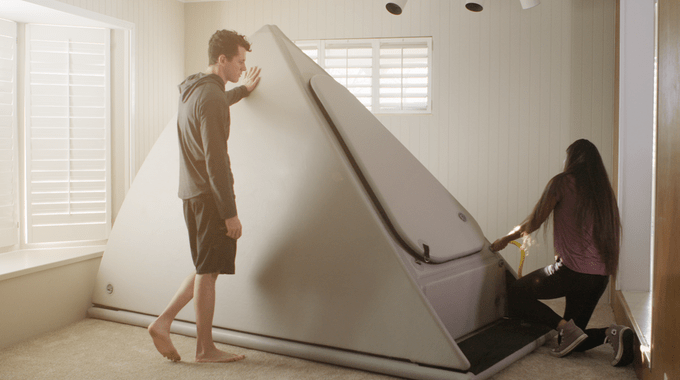 Introducing the Inflatable Zen Float Tank | You Have to Be Kiddin’ Me! Psst, floaters, may I have your attention, please! What if I tell you that there is a real possibility for you to have a float spa in your home? That’s right. Imagine the alluring comfort of being able to enter into your own sensory deprivation tank which is waiting for you in the living room. 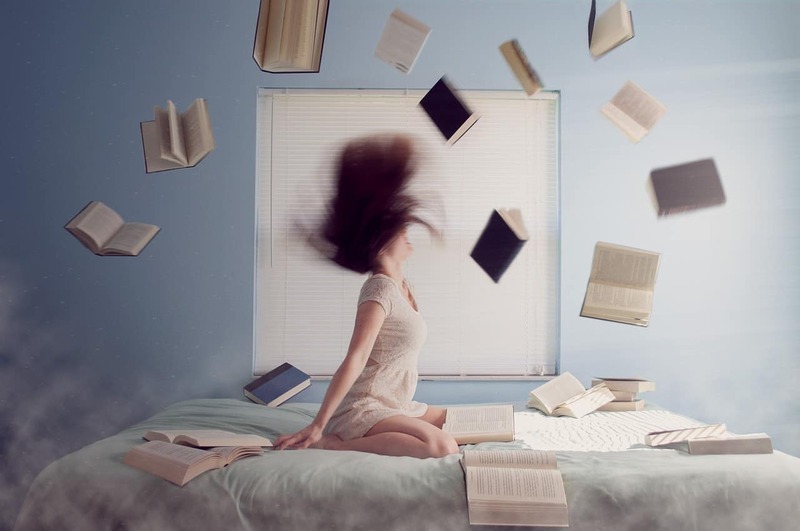 Now imagine that after a long and exhausting day you are already in the tank, floating effortlessly and slowly forgetting about the busy world around you. No noise, no light, no sensors, no problems, no stress, not even the slightest ounce if it. Just you in a deep meditative state that relaxes you in a way that only the sensory deprivation is able to offer. The Inflatable Zen Float Tank, Image via ZenFloatCo. Most importantly, you didn’t have to bother driving for an hour in order to get to the nearest float center. You didn’t have to stuck in the annoying traffic jam and you didn’t have to book your session a week in advance, not knowing whether you were going to make it or not. Plus, no matter how great a float spa can be, it can never compare to the genuine comfort of your cozy home. That’s a fact. All that sounds tempting, doesn’t it? Let’s admit it – we all strive to ease our lives as much as we can in a world that becomes more and more complicated with every single day. The good news is that with the newest innovation in the floatation tanks industry, floating at home has never been easier and so affordable. I am talking about the innovative inflatable zen float tank, courtesy of ZenFloatCo. Four years have passed since the apparition of the first home floatation tank that completely changed the game – the Zen Float Tent. The highly popular tent quickly became the darling of thousands of floaters around the world by responding to an important emerging need – to have an affordable and comfortable way to experience sensory deprivation at home. 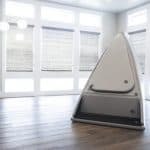 Now, the creators of the first home floatation tank are in the spotlight once again with the upgraded version of the zen float tent – the inflatable zen float tank. Their public raise-funding campaign on Kickstarter gained huge international attention and finished successfully just for 3 months. Why is there so much buzz in the floating community surrounding the new inflatable tank? What exactly is it? Is it an improvement of the well-known tent? Is it really so affordable and easy to set up and maintain? In the rest of this review, I am going to try to answer all these questions in detail so that you have a better idea of the newest innovation in the industry. Who knows, it might be just for you. So bear with me and let’s start. What the Heck is an Inflatable Tank? What About The Epsom Salt? I know that it sounds pretty straightforward…and it is! In order to set up the tank, all you need to do is to inflate it with a pump, just like an air mattress or a swimming pool. Can you believe that! To be honest, when I first heard about it I thought that this was ridiculous, unsafe, and unreliable. However, it turned out that it was exactly the opposite. But more on that in a minute. In a nutshell, the inflatable float tank functions just like the good old Zen Float Tent with some small but significant differences. It’s like the tent on steroids. The new tank is created using an advanced drop stitch technology. To give you an idea, this is the same material they use for manufacturing kayaks and paddle boards. And as you probably know, they are made to endure rock shocks. 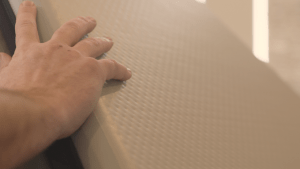 Basically, this is a really durable PVC material that once inflated is hard as a shell. That makes the tank easily transportable, fast to set up and rock-solid. For this new product, ZenFloatCo continues to use the pyramidal shape of the tank just like with the float tent. In case you are wondering, there is an important reason for that. This design is convenient because the condensed water runs down the sides of the tank instead of dripping off the ceiling. Imagine what would be like the other way around – to feel small drops of water falling from the upper surface landing on your chest or belly while you are just starting to relax. I have to tell you that often this happens with other commercial tanks. No joke. The tank is slightly bigger than the zen tent. What is good is that there is more room to float in the so-called floating bed inside. To be more specific, the tank is 4’9″ wide, 9’1″ long and 6’2″ tall. Compared to the tent, the tank is 2 inches wider on the inside. Also, in the tank, you can stand up in it unless you are 5’11 (180 cm). So, you will surely feel more comfortable with the extended space. 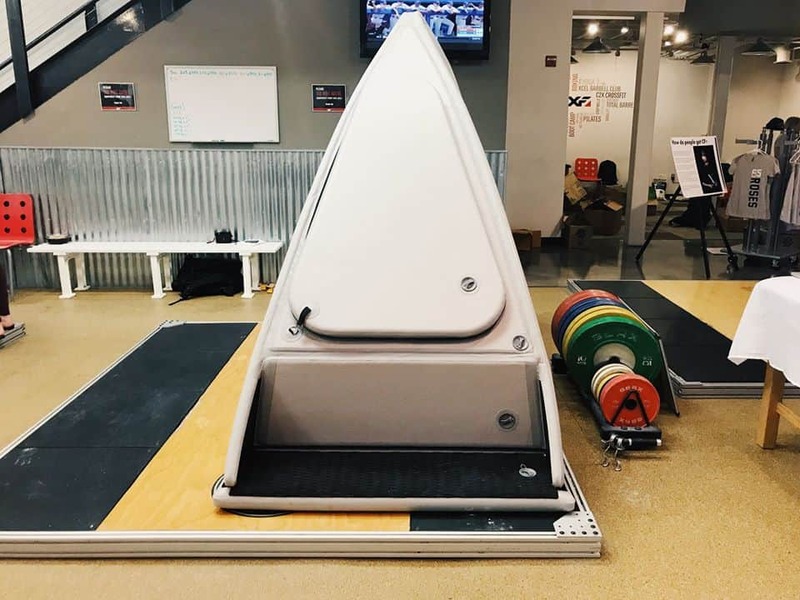 Now check this out – one reason for the bigger size is the presence of a step platform. That allows you to step out of the tank and safely drip off all the water and salt so that you don’t damage your floor. This is something that I find smart and very practical. The tank is 100 lbs and the total weight including the water is 2200 lbs. The liquid capacity is 201 gallons or 760 liters if filled with 10” (25 cm) of water which is completely enough. Another thing to mention is the volume. The tent is 77 cubic feet while the new tank is 99 feet. As I like to say, the more the better. As outlined above, the tank uses the same technology just like the zen float tent. That means that it uses the same heating pads as already described in my review of the tent and the powerful filtration system is the same too. Several months ago they switched from a two-hose system to a one-hose system which is a lot more powerful. The pump that comes with the tank can filter the 200 gallons of water for two hours. Read more HERE. No, I am not going to tell you why I consider ‘Back in Black’ as the greatest rock album ever. I just want to outline that the new inflatable tank uses the same voltage as the tent, meaning that it is 110 Watts for US customers and 240 Watts for international customers. There are 325 Watts on each of the two heating pads so that makes the daily usage 650 Watts. You can inflate the tank with a pump. 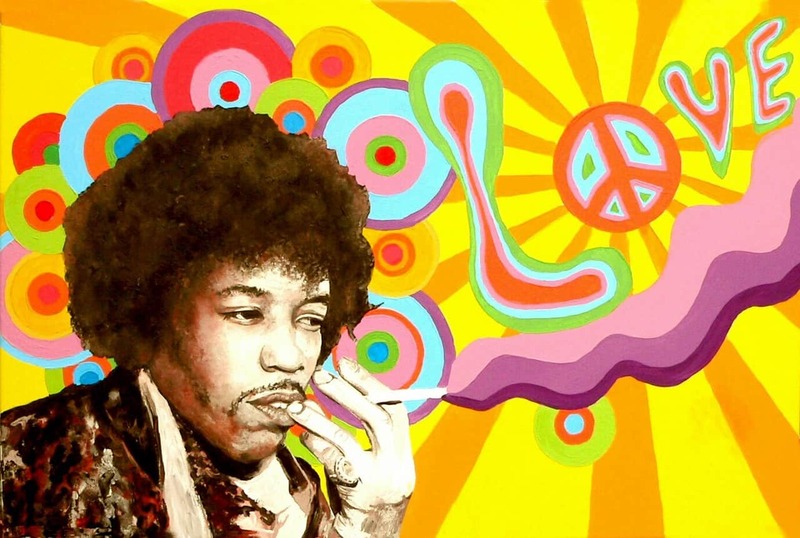 Image via ZenFloatCo. This is something crucial. The fact that the tank is inflatable is really groundbreaking. It means that it can be assembled (or better to say inflated) for just 20 minutes. Then, of course, you have to fill it with water and to heat it but, again, for 20 minutes you have a float tank in your house! To compare it to the tent, it assembles for an hour. Still not bad but 20 minutes is a lot better. Imagine how easy it would be to transport it if you decide to move. You just drain the water (more on that later) and deflate the air. After that, you just inflate it with a regular air pump and you are almost ready to start floating. Neat, huh? The sophisticated drop-stitch technology makes the tank more solid and robust. Now, admit what you are thinking – the tank is inflatable, therefore it is easy to puncture it. In fact, that’s what I thought, at least before digging deeper into the technology behind it. The zen float tent is made using stainless steel poles with a vinyl cover. It’s not the case with the new tank. It turns out that the technology behind the drop stitch is comprised of thousands and thousands of finely woven threads that connect two pieces of polyester fabric. In other words, it is hard as a rock. So in the almost impossible case of puncture, you will first lose air if you’re even going to lose water. Plus, there is no pressure that would allow the loss of air. That’s my favorite part. Because of its technology, the tank is more insulated than before due to all the layering. First, that means that it is more sound proof. Secondly, based on the calculations, it is 40% more efficient. Why? Because it is more insulated, it maintains the heat better and longer and you are going to use less electrical power to heat up the water inside. And that will save you money. 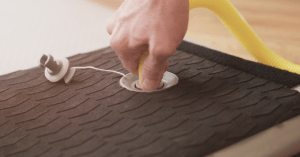 This comfortable step mat will always keep your floor safe. All the water and the salt will never get to your precious carpet. While the tank is bigger than the tent it still easily fits in any home. There is more space to float and you can stretch better in it. Let me explain that. If you put the float tent on a cold floor like a cement in a basement, for instance, it is recommended to put a carpet padding for extra insulation. Now, the heater pads are on top of the inflated platform and the tank is on top of that so there are no cold floor issues anymore. You can put the tank on any surface without being concerned about how to isolate it. You have a space in your garage or in the basement – so be it! With its robust technology, the new tank looks and acts a lot like a regular commercial tank. For the entrepreneurial-minded, this might be an opportunity. However, do know that the commercial use voids the warranty. Before freaking out, read this: because the business model of the manufacturer ‘ZenFloatCo’ is based on the domestic use of the tank, a commercial use would wear out all the parts faster. The company cannot replace parts all the time because of this. They didn’t plan that when creating the tank and the tent. But here are some tips coming directly from the horse’s mouth. If you plan using it for commercial purposes you would want to upgrade the filtration system and consider implementing a more powerful filtration pump that can filter the water for 30 seconds. In that way, the next customer can float without waiting. There are plenty of such pumps on Amazon but the price is bigger. In short, to get your tank commercial ready you’d want to spend an additional $1500. However, even with that in mind, the price would be better than the price of a regular commercial tank. Usually, they start at $15 000. Let’s assume that you need to move your tank. The first thing to do is to drain the water. Fortunately, that is easy. You have two options to do that. The first one is to use a sump pump. You can find such on Amazon for 50 bucks. However, if you don’t want to spend money, you can still drain the water by simply turning the tent down and using the gravity. As with the tent, with proper care, the water and the Epsom Salt can last for two years. Again, you need not more than 20 minutes per week for water maintenance. This involves basic cleaning such as hair removal, checking the water levels, Ph levels, and salt levels. In the delivery package, you receive a complete water care guide that will certainly make all that very easy. With the purchase of the tank, you receive everything you need to start floating except the 850 lbs. of Epsom Salt. That, you need to purchase separately unless you live in some of the lower 48 U.S. states. 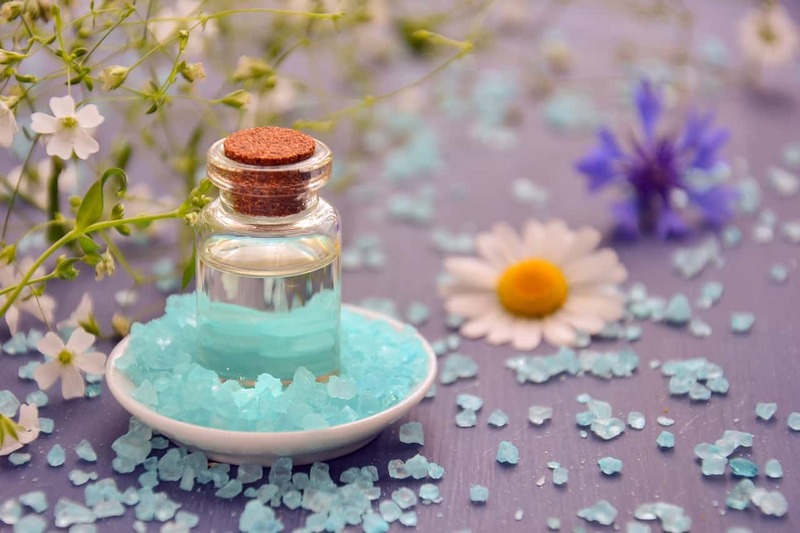 In this case, you can order salt directly from the site of the manufacturer here or you can take advantage of the ‘Float Ready’ package deal that includes Epsom Salt + shipping costs + extra bonuses that will save you a few hundred bucks. More on that in a minute. Otherwise, you can find salt in bulk in a local store or on Amazon. It is easy to find. Seriously. Have a look at the most important features that stand out respectively for the tank and for the tent. Once again, the tank comes with all the components that come with the float tent. Sure enough, that also includes 10-year defects warranty, one-year mechanical warranty, and worldwide shipping. Weight (with water + salt) - 2100 lbs. Weight (with water + salt) - 2200 lbs. *Commercial use of the inflatable tank is possible but not recommended due to reasons already outlined above. The price of the inflatable tank is $4200 for the North American and for the International Version. As already discussed, that doesn’t include the Epsom Salt which costs $432 for 850 lbs (sufficient for at least a year). If you are familiar with the zen float tent and my review of it, then you know that there is a ‘Float Ready’ package deal available only for the lower 48 U.S. states that includes the Epsom Salt plus shipping and handling costs. Now, the price for that is $5200. Do you know what I honestly think? I think that this is a big upfront cost. That is why you need to have a float practice or to have the desire to start one in order to justify the purchase of the tank. If this is the case, then the tank is a no-brainer for you. Let me tell you why. If you do the math, you spend a lot more money (not including the time and the efforts) to go the Float Center. So if you are floating at the spa center, you are losing money by not investing in the tank. In other words, you can’t afford not to have it. If you compare the inflatable tank (or the zen float tent) with any other option on the market, then you will see that the cheapest one starts from $6400. This is the case with the Samadhi tank, for instance, and believe me when I am saying that it doesn’t match the quality of the zen float tank at all. All the other options start at $15 000. Anyhow, if you live in the lower 48 U.S. states and you want to purchase the tank, the ‘Float Ready’ package deal is an excellent choice because you receive everything you need to start floating right away at a tempting price. Some of the bonuses include underwater ear plugs, hair conditioner, and hydrometer. Don’t forget them! You can inform yourself about the shipping quotes here and get one. The inflatable tank is the best and cheapest option on the market with an unparalleled ratio quality/price. 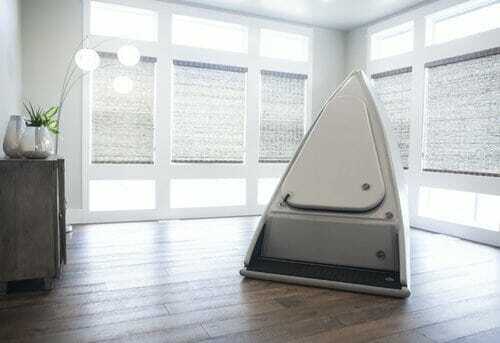 It is a praiseworthy successor of the zen float tent. If you are regular in your floating practice or you want to invest in your health by the means of the floatation therapy, then the comfort of floating at home with the tank will save you some serious amount of money. Have you ever considered the opportunity of bringing your floating experience at home? Leave a comment below! Easier set up - it inflates for 20 mins. Thank you for sharing this article, I didn’t know that I could install a float spa in my home. It’s useful and genius. I wish I could buy one in the future. You are most welcome. Yes, the opportunity to float at home with this inflatable tank is really amazing. Hi, I’m back again on your float tank page. I’m really interested and saw now the new review of the Inflatable Zen Float Tank. I realize it is even a little cheaper than the tent and comes with even more advantages. Nice to have you back, Stef. In fact, the tank is a bit more expensive than the tent but that is because of the size and the materials. It is a really huge upgrade. I am sure that you are going to like the experience. Feel free to approach me anytime if you have any questions. This is actually really interesting as I have dabbled with meditation and would love to try a sensory deprivation tank. The only problem is there are no services where I can test it in my parts of the world currently. I wonder if they ship these to Europe, I have to take look. I don’t have too much room in my apartment so this might be a good solution. The price is a bit steep without testing though and I wonder if cleaning the thing is chore after a while? The inflatable float tank ships worldwide. The water maintenance requires 20 mins per week. The rest is done by the filtration system which is really good.In that way, you can change the water on every 2 years. The possibility of having a float spa right in my living room leaves me smiling from ear to ear, it’s truly awesome. And due to the use of drop stitch technology it looks darn durable too. I am definitely going to save for one of these, can’t wait to have it! The inflatable zen float tank is a very cool gadget. I offes unparalleled comfort and the cheapest price on the market.